Dock water hoses can be seen connected to lots of boats in marinas. 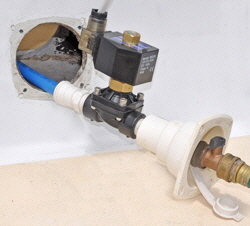 A water hose connects to a dock faucet and a pressure reducing inlet on the boat. 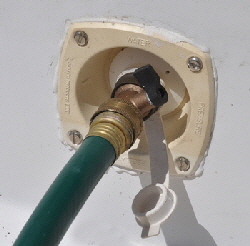 This reduces municipal water pressure, usually around 60lbs, to about 35lbs and pressurizes the boat’s water system. BRITANNIA had this system built-in from original, and we liked the advantages and convenience. The advantages are, constant pressure in the boat’s water system without using pumps or battery power, a more even flow than a small pulsating pressure pump can deliver for say, a shower, and silent operation. Britannia’s 1/2” inch plastic water pipes were as old as the boat with a maze of connectors all in a tangled mess. I had repaired or replaced many sections which leaked or cracked from time to time, which the automatic bilge pump had alerted me to. It was always my practice to turn the water off at the dock faucet whenever I left the boat, even for a short time, and when I left it for days I would actually disconnect the hose at the dock. This was because if a pipe failed inside the boat there was actually nothing to stop the water pouring in under pressure from the dock. My thoughts turned to how to make a fail-safe system, because there was no accounting for internal failures. We always switched the water off on the dock when we left the boat, but that's not foolproof, because it’s easy to forget. The most obvious foolproof remedy was not to use a dock water hose at all, and draw from the tanks, refilling them as needed. But you might say the same about a shore power electrical supply, which everyone uses without a second thought, but which have been the cause of many an electrical fire. As a cheap added safeguard I fitted a second shut-off tap at the hose/boat connection, just in case anyone switched the dock faucet on again. This was still not an automatic safety measure, so I considered how I might install some sort of automatic shut-off. I found a 12 volt solenoid water valve at Sizto Tech Corporation, in Palo Alto, California, for $74.25. It is normally open, but instantly closes when voltage is applied. I connected it directly after the pressure inlet, and wired it to the bilge pump float switch. 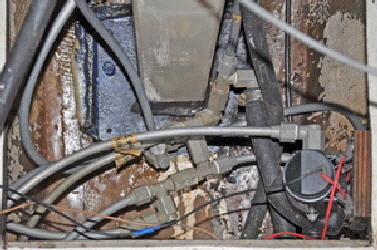 On tests it closed flawlessly, but when the bilge pump lowered the water and the pump switched off the valve opened again and the cycle repeated continuously To prevent this I incorporated what is called a latching relay from Xoro.com for $22.89. Part # 785XBXCD-12D. This works like a normal relay except when activated the secondary circuit stays live and keeps the shut-off valve closed, even when the primary power disconnects. 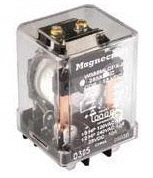 The relay only powers off when the circuit is manually switched off at a breaker. I also wired a bell into the circuit, which rings when the system is activated. In other words, the boat now has a high water bilge alarm which is required by many marine insurance companies . Feeling very satisfied with myself, I decided to find out how many boats in the two marinas in Titusville, Florida, used shore water hoses. Out of a total of 20 boats with direct shore water connections I managed to actually ask the owners of 12 if they had any fail-safe method, in case an internal failure. Amazingly absolutely none did! They all relied on remembering to switch the water off when they left the boat, or hearing the bilge pump working it’s socks off, if they were aboard!